Life is good for Lara Jean. She is head over heels in love, her dad’s finally getting remarried and her sister Margot is coming home for the summer. But change is looming. 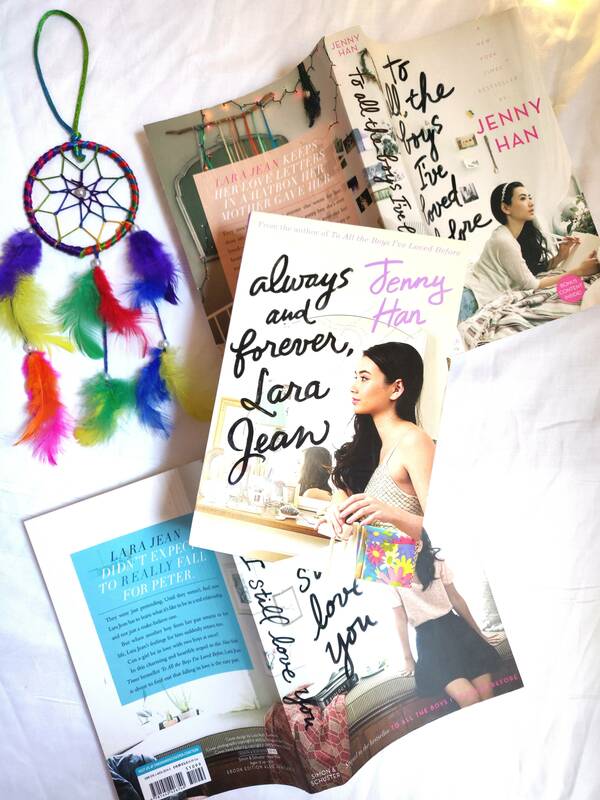 And Lara Jean can’t just ignore the big life decisions she has to make – where she goes to college for one. Because that would mean leaving her family – and possibly the boy she loves – behind. Well, there’s not a lot I can or want to say about this book. I thought it was good. I liked it and enjoyed it. I was just expecting more. I haven’t read any YA books that show characters getting closer to graduating from high school, the constant stress and anticipation of starting the next phase of life, nervously waiting to see if they got into the college of their choice. We don’t get many books that deal with this transition from a student to a high school graduate – the excitement, the nervousness, the feeling of dejection and inadequacy with each rejection (or elation and relief when you get your first acceptance letter) and everything else that comes with it. This final installment in the trilogy dealt nicely with all of this and more as Lara Jean and Peter finish their last year of school and have to figure out what it means for their relationship. What will happen to them, should they be basing important decisions on each other at all? I don’t know if they did the right thing or not, differs from person to person, I suppose. Different people need different things and take decisions based on a variety of factors. I’m not sure I liked how it ended, only because it didn’t feel like an ending. It made me want more. I just have all these questions now like I want to know what happens when they go to college? What is Kitty like when she grows up? Does Margot get married someday? What about Josh? And John? And Chris? I was beginning to get really involved with all the characters and it doesn’t feel like I got enough of them just yet. This book was mostly about family and the future and finding your way – all of this I liked but I was also expecting some more shenanigans. The first book was adorable and a lot of fun. The second one was not as fun but John still made it cute. This one wasn’t that fun or cute – it was a bit heavier, more real but still enjoyable for a different reason. I guess the whole series is a solid 4-star read for me. I would recommend it to teens. And of course, I’m here for the upcoming movie(s)! Loved the first one, excited for the second one and hoping there’ll be a third one with a better ending tying everything up. Also, in this case, I might just like the movie(s) more than the books. It’s possible. And that’s a wrap for this trilogy! Have you read this series yet? Are you planning to? Excited for the movie? Let me know in the comments below! I keep meaning to read the second and third books from this series, I’m glad you enjoyed the final installment, for the most part. Great review!